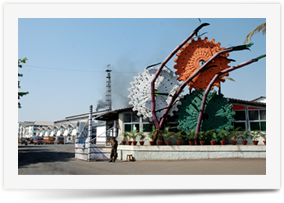 This factory was registered under co-operative act on 9th June 1969. The state selection committee of govt approved the ceremoniously laid on 3rd September 1969 after the site. Of Maharashtra. After collecting requester amount of share capital and with crushing capacity of 1250 M.T. of sugarcane per day. The project was completed within just 14th months on 16th March 1972 the factory commenced its regular season. Shirol Taluka of Kolhapur district is gifted by the presence of natural irrigation potential on account of major five rivers i.e. Krishna, Panchaganga, Warana, Dudganga & Vedganga. Shirol Taluka is having fertile land of alluvial type soil. In view of the above promoters of the karkhana had conceptualized to setup a sugar factory to facilitate socio-economic development of the area.A pioneer efforts were made to constitute Shree Datta SSSK Ltd., Shirol, by Late Shri Vishwasrao Ghorapade , Late Shri Dinkarrao Yadav, Late Shri Dattajirao Kadam and Dr. Appasaheb alias S.R.Patil the present Chairman. Our aim is to give maximum return to cane growers by producing quality products with minimum expenses. We are committed to improve the environment. We will strive to improve our performance on continuous basis through effective implementation of quality Management System. Initial Install Capacity : 1250 TCD.